We’ve taken cheeseburgers to the next level with the help of a little something called frico (aka cheese crisps). They look fancy-schmancy, but making them simply involves baking cheddar cheese until it reaches crispy, golden-brown perfection. 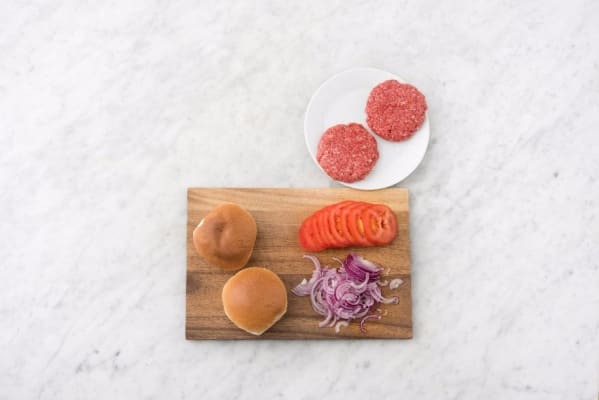 On top of burgers with onion jam, tomato, and ketchup, they feel like a crowning achievement in topping technology. Wash and dry all produce. Adjust rack to upper position and preheat oven to 425 degrees. Halve, peel, and thinly slice onion. Slice tomato into rounds. Split buns in half. 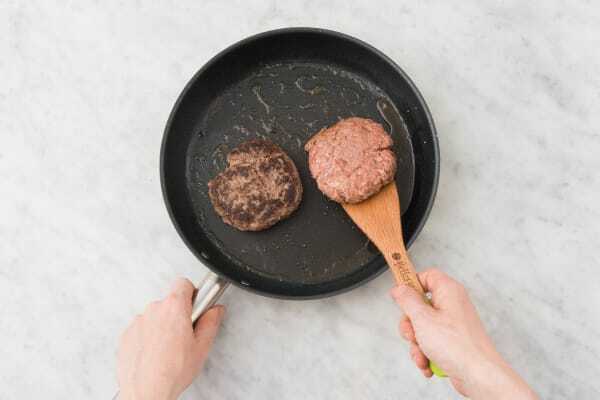 Shape beef into two evenly sized patties (make them slightly wider than the buns). 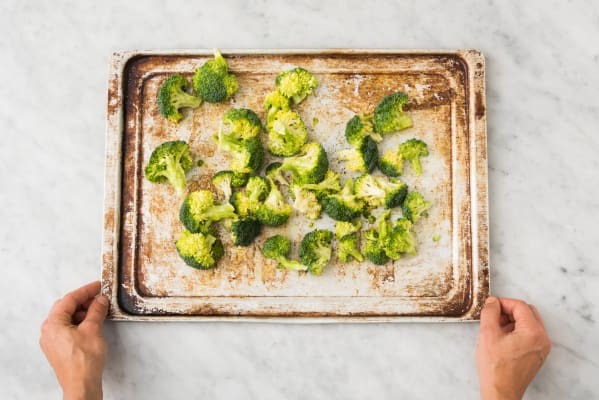 Toss broccoli on a baking sheet with a drizzle of olive oil and a pinch of salt and pepper. Roast in oven until lightly crisped, 15-20 minutes. Heat a drizzle of olive oil in a large pan over medium-high heat. Add onion and cook, tossing, until soft, 5-6 minutes. Stir in 1 TBSP vinegar (we sent more) and 1 tsp sugar. Simmer until liquid is nearly evaporated, 1-2 minutes. Season with salt and pepper. Transfer to a small bowl and set aside. Lightly grease another baking sheet with cooking spray. 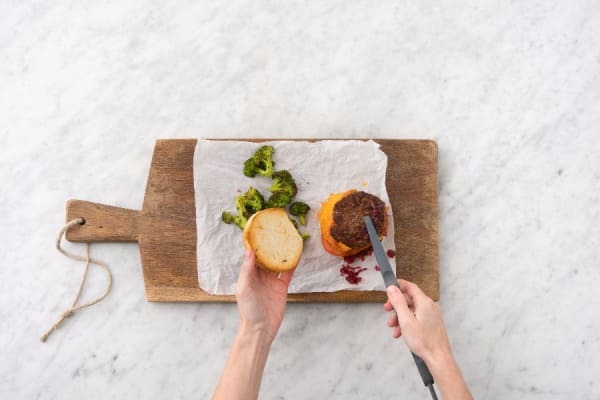 (TIP: Alternatively, line your sheet with parchment paper or lightly oil.) Place cheddar on sheet in two even piles. Bake in oven until melted in middle and crispy at the edges, 5-7 minutes. Let cool on sheet for about a minute after removing from oven, then transfer to a plate using a spatula to cool further. 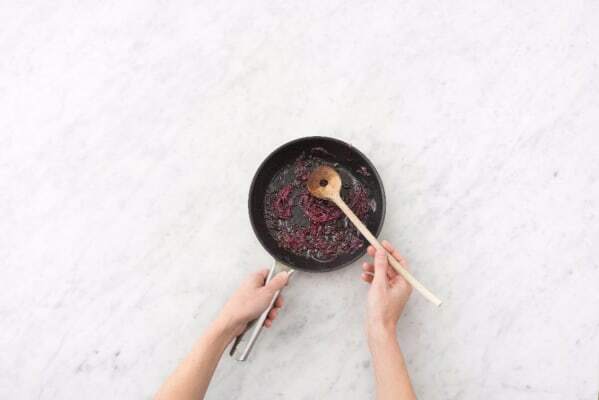 Meanwhile, wipe out pan used for onion jam and heat a drizzle of olive oil in it over medium-high heat. Season beef patties all over with salt and pepper. Add to pan and cook to desired doneness, 3-6 minutes per side. 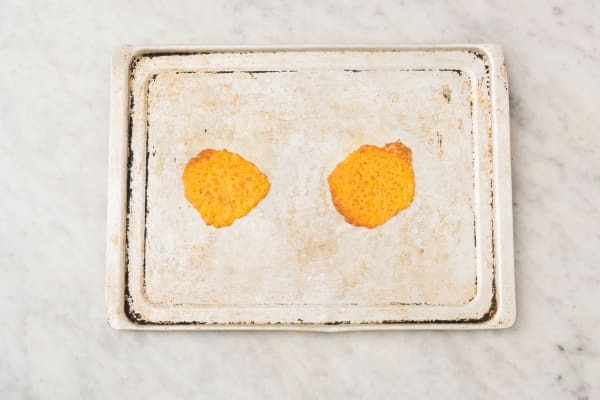 Meanwhile, place buns on sheet used for cheddar frico. Toast in oven until golden, 3-4 minutes. 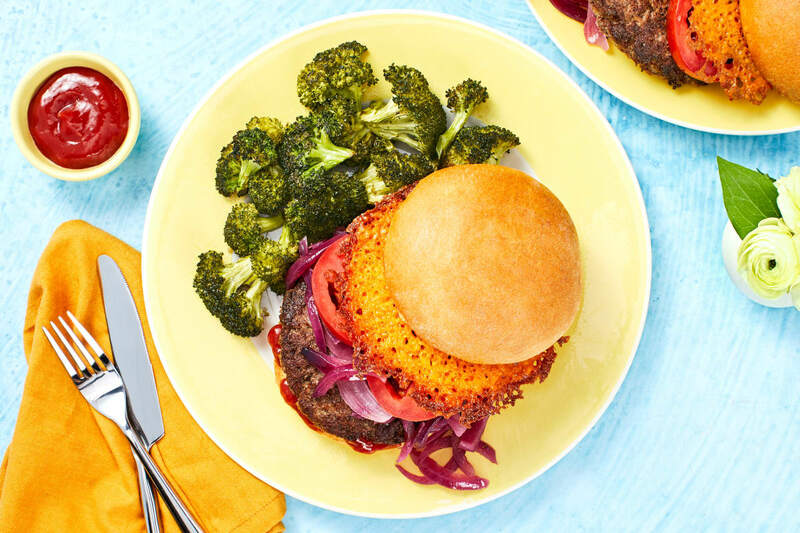 Fill each bun with a beef patty, onion jam, tomato slices, ketchup, and a cheddar frico. Serve with broccoli on the side.